HABIT: Fragrant pink to red ½” flowers in 6”-8” clusters. Large dark green leaves with fuzzy undersides. Showy summer flowers. Spreads aggressively by underground suckers. Cut back severely in the spring and pick-prune through the growing season to maintain interesting summer color and texture. CULTURE: Very easy to grow – maybe a little too easy. Drought tolerant and needs little care. USES: Attracts hummingbirds. Good with other aggressive plants like perilla, Houttuynia, and hoja santa where spreading is not a worry. PROBLEMS: Is very invasive. 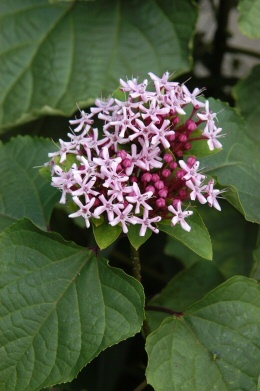 Clerodendrum paniculatum is the pagoda flower. Clerodendrum speciosissimum is the dramatic java plant.